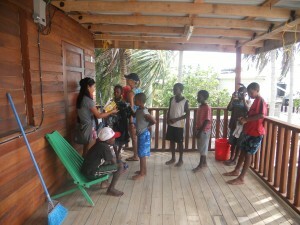 Belizean Sands » Caye-p It Clean!! One of the needs we identified during our time on the island and talks with the community was the need for a caye clean up. As I’ve mentioned before, trash is a pretty big problem out here. 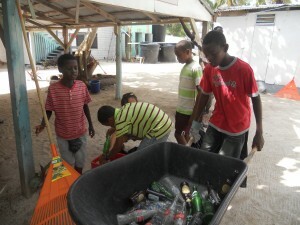 Not only do they have to figure out what to do with the trash generated on the island itself, but its position as one of the first barriers from the open sea means that lots of outside trash gets washed onto shore from boats and even up from Honduras and other countries. 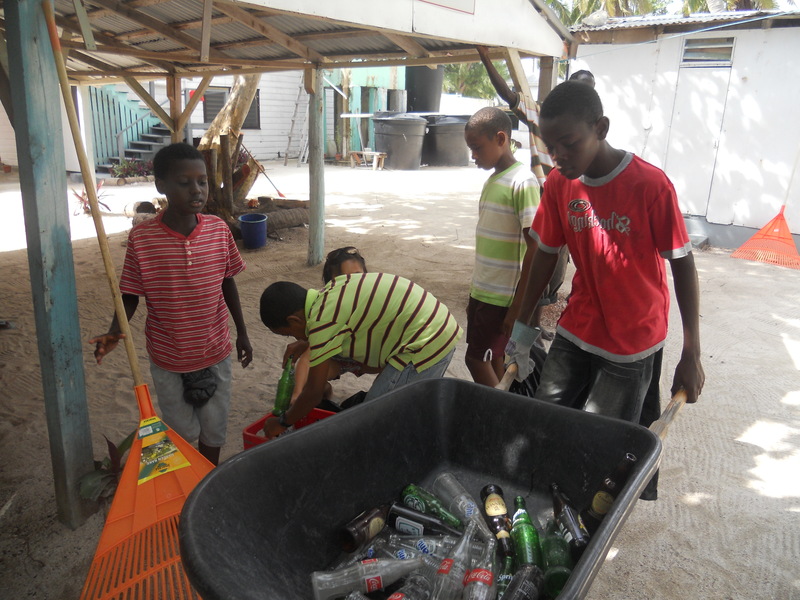 There had been beach clean ups before but not for a while so we decided to organize one along with a BBQ afterwards to really try to get people together (lack of cooperation and community was another problem cited by islanders). We scheduled the clean up to start at 9 am, but these guys were waiting for us at 8:40, ready to get started. 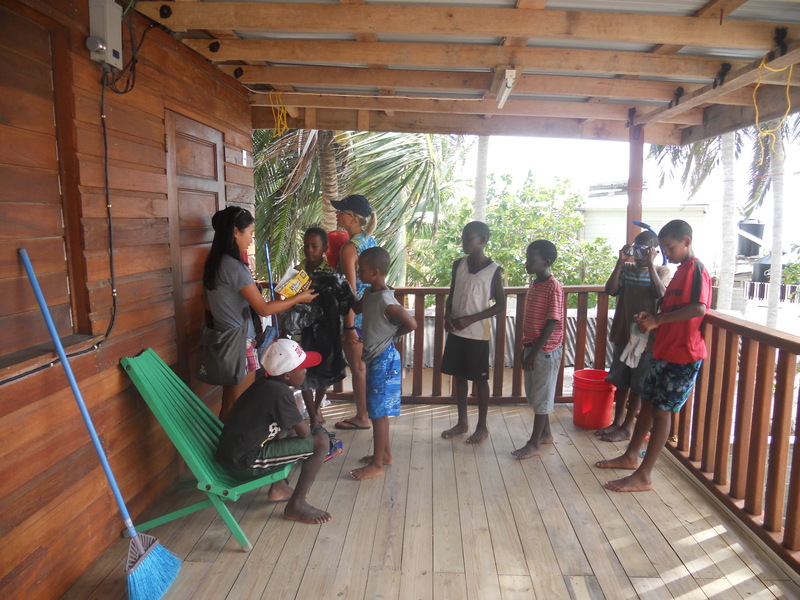 Entertainment is pretty hard to come by for kids on a remote island, although I have been impressed with their innovations of ways to stay occupied. One of their favorite games was to take a glass Fanta bottle throw it out into the water then dive in and try to get to it before it sinks. We figured since they were already picking up trash (or littering depending on how you look at it) we might as well put all that pent up energy to good use. The adults got pretty into it as well. 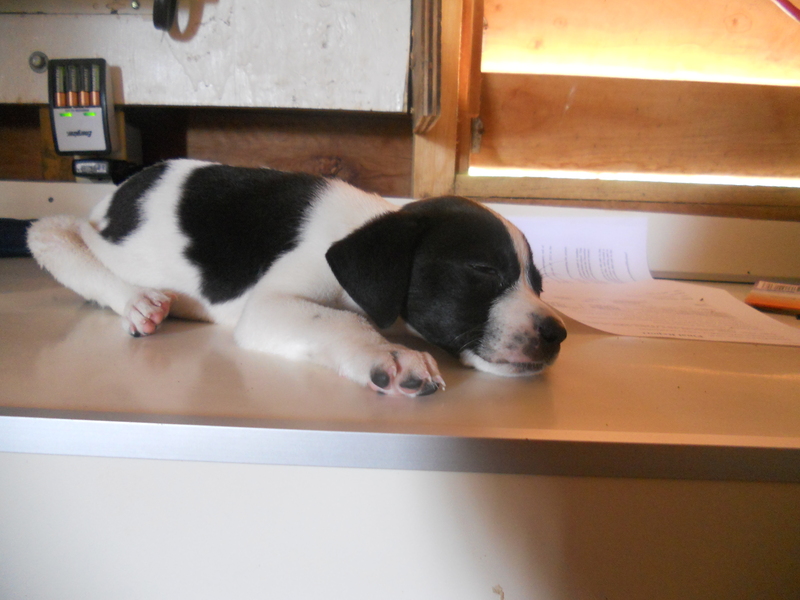 This is AC helping us to clear out a “trash pile”. 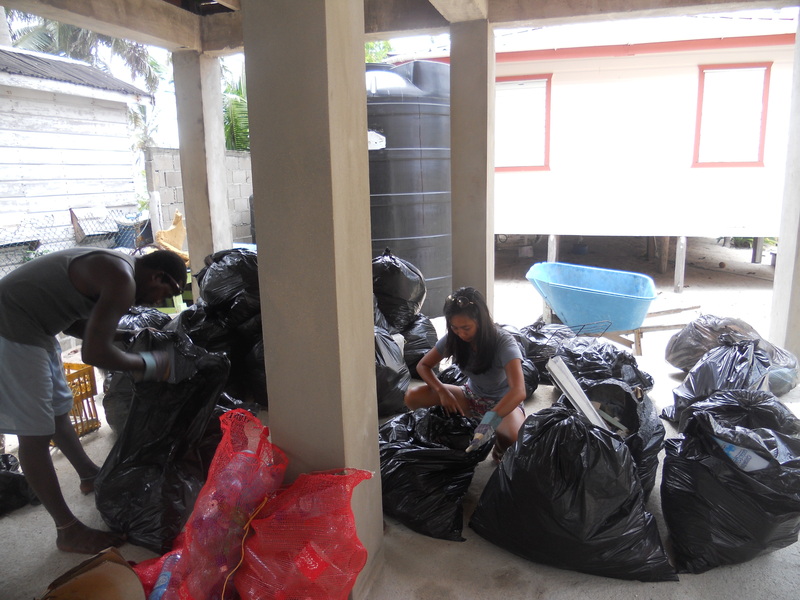 These piles are placed around the island and mostly consist of palm fronds and coconut husks but when you dig a little deeper (trying to avoid the rats that like to live in them) you find all sorts of other garbage like plastic bottles, old shoes, broken toys etc. This is particularly troubling because these piles are burned when the wind is right. Not only does burning plastics and other non biodegradable material release harmful chemicals but these piles usually don’t burn hot enough to fully deteriorate the trash, just melt it into a smaller form which eventually ends up in the water anyway where it can easily be mistaken for food by a marine critter. The kids ran around like crazy for about 45 minutes and collected an impressive amount of bottles and trash, clearing nearly the entire island. Their crash was just as dramatic and they all plopped down on the recently filled crates demanding juice. We figured they’d earned it and got them some snacks and juice. The local adults however were not impressed and launched into the apparently international complaints about “kids today.” AC informed us that when he was a kid he had to fill up bags of sand everyday before school and carry them home, then after school he had to fill up more bags of sand before he was allowed to play soccer. That was certainly a new twist on the whole barefoot in the snow story. The spoils of our efforts were dutifully sorted through by Eric and Anna to make sure no recyclables had snuck in with the trash. The real challenge was figuring out what the heck to do with all the trash. After calling around to 4 government offices I finally found out that the trash in Dangriga (the mainland city) is picked up on Mondays and Tuesdays. The Northside on Monday and Southside on Tuesday, but there’s no real divide between North and South (like say the river which seems like a pretty good marker to me) it really just depends on how far the first guy gets on Monday. Typical Central America, go through the pain of making a phone call (can’t believe I’m saying this but I miss land lines), finally talk to the right government official, and they have no more idea of what’s going on than I do. So in the end we chose the typical developed world solution and threw some money at the problem. 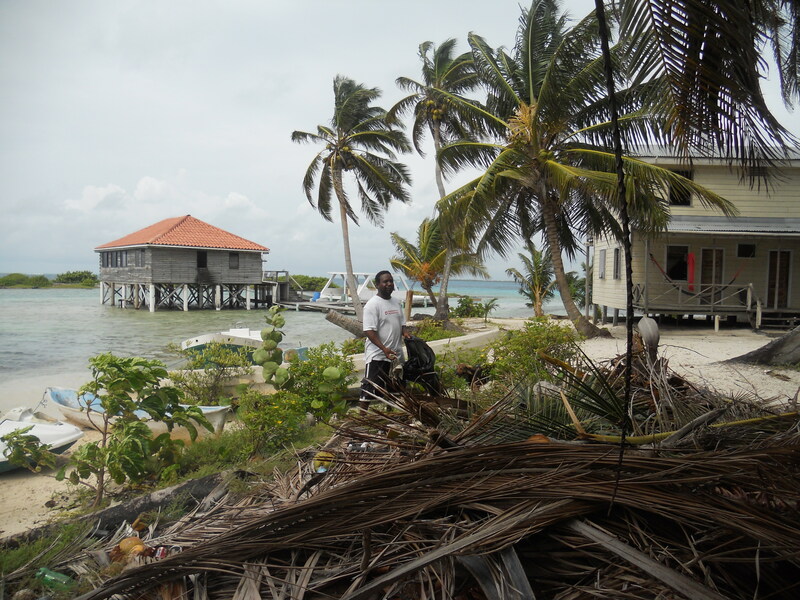 The Tobacco Caye Marine Station which also provided all the bags and gloves and other supplies, also hired a local to take the trash from the island to the mainland by boat then 6 miles out of town to the official dump site. 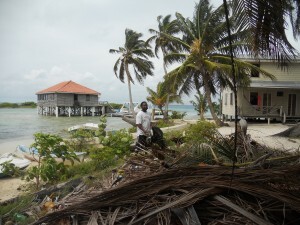 This we considered the best available solution, at least better than just throwing it into the mangroves. 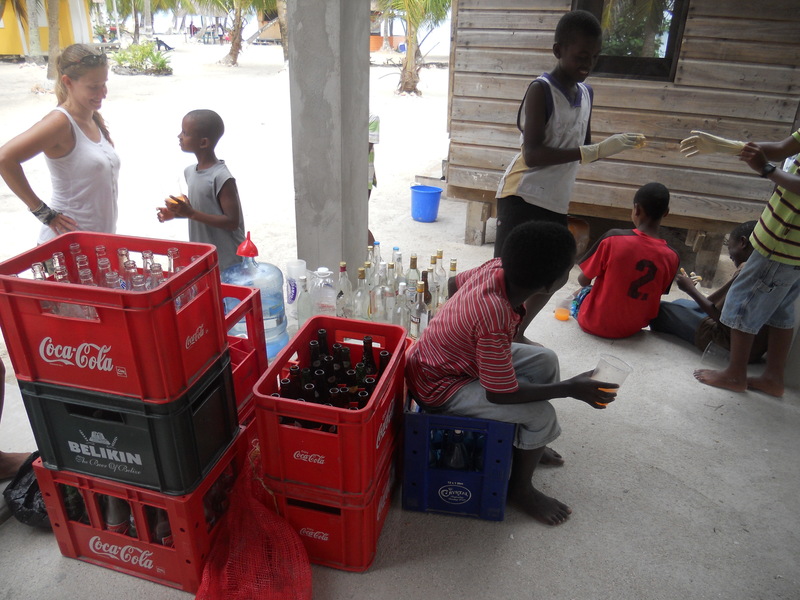 After the clean up it was time for a well deserved party. 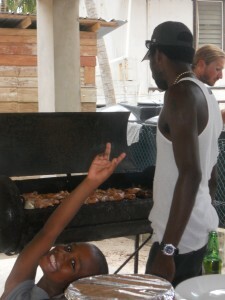 Chop manned the grill with some of the other menfolk and barbequed 15 pounds of chicken. I don’t eat meat but it smelled pretty good. 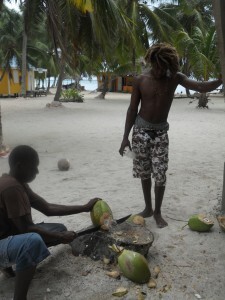 Ashford and Kristian added an island twist to the beverages by chopping open green coconuts for everyone to drink from. The coconut water is not only tasty and surprisingly clear but it’s supposed to be even more hydrating than regular water. Good to know in case you’re ever stranded on a tropical island, which I must say I highly recommend. Being a mascot is hard work too.